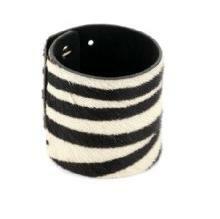 Leave them gaga at the Go-Go with the Streets Ahead Italian Hair Calf Cuff Bracelet with Zebra Print. The brushed calf hair in this black-and-white striped pattern bristles with the call of the wild. This urban jungle leather cuff is 2.25 inches in diameter, 2.38 inches wide, and clasps with antique silver collar studs that adjust between 6 and 7 inches. Streets Ahead, inc., known for their thriving leather accessory brand is poised to celebrate thirty years of business in the fall of 2011. David Sack, President and CEO of the company, originally formed “Streets Ahead” (a South African saying that means ‘ahead of the pack’) in 1981. Today the privately held corporation’s production is under the guidance of David and wife Michelle. David’s consistent dedication to the high end, hand crafted accessory, continues to draw a great deal of private label business from world- renowned designers and licensed brands. Each collection has over 150 styles per season, proudly designed, with excellent workmanship, in California.